This summer, even for the hedonistic consumption of the Premier League, was unprecedented. Spending topped one billion pounds, with Manchester United breaking the World transfer record, in the region of £95million for Frenchman Paul Pogba. Many within the football world were left dismayed that United payed so much for the Juventus player who the left the club for nothing in 2012. More disheartening for fans is the reputed 30% or if we conservatively round this down, the £20million fee super-agent Mino Raiola will collect. Whilst football agents, the games infamous middle men, have been around since the early 1960’s, the term super-agent is only a recent arrival into the lexicon of association football. As money has flowed into the game, a powerful few have amassed enough resources to move from mere Agents to the grander media christened term ‘Super-Agents’. Empirically of course it is difficult to typologise super-agents given the somewhat blurred boundaries, but we are told they are the most powerful men in football, not mangers, players, leaders of the games governing bodies, but agents. However, what are we to make of super-agents and their networked world. 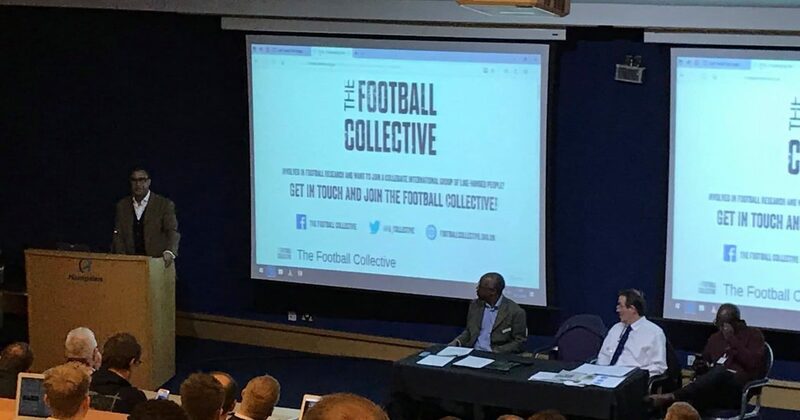 Are they to be demonised as neo-liberal capitalists, fuelled by finance and commerce at odds with the cultural meaning of football as social institutions, or do they play a pivotal role in the production process, using there connected worlds to produce a global game. It is clear that the media and public perception of the role of the football agent has been dramatised as “the root of all evil” the people who “take money out the game” and “only think about themselves” , however on looking behind the curtain the role of the agent who represents a club in the transfer of player (buying or selling) or represents the player in negotiating an employment contract are necessities not only in football but in global commerce. In this article, using a Social Network Analysis (SNA) we critically explore the networked rise of super-agents and how these structures give them power, resources and a means to restrict and skew the market. In doing so, we aim to provide both academic and industry insight. The rise and role of the Super-Agent? How did we get to this situation, where a powerful few have engineered a market-trading environment that not only facilitates a specific role for itself (agents), but one which would not function without them given their centrality to this market. We consider that the rise in super-agent is fundamentally a network phenomenon. However, it is clear that through their networks, super-agents have taken power from others and have created more for themselves. Perhaps the embodiment and archetypal manifestation of this is Portuguese businessman Jorge Mendes and his GestiFute networked empire. Before exploring the networked nature of the GetisFute empire and its implications for global football, it is important to put the market and the agents role into context. “…representing the player in a contract negotiation requires payment whether it is a registered intermediary or a lawyer, whilst the credibility of a lawyer is not in question in most part (mostly due to the time spent educating themselves). The role of an intermediary negotiating raises suspicion of lining their pockets. Intermediaries who are credible and have experience should only be looking for the best deal for their client and if this is matched by the club then the player is paid and the club may pay the agent fees on behalf of the player. Despite the significant numbers registered as agents, the market especially in the big European leagues follows somewhat of a power law distribution, i.e., more players are registered with a fewer number of agents. These agents gain further power and control becoming super-agents. We turn now to GestiFute and Jorge Mendes. The rise in super-agents we believe is a network manifestation. The GestiFute networked business empire is illustrated below, it is an ego-net of Jorge Mendes. 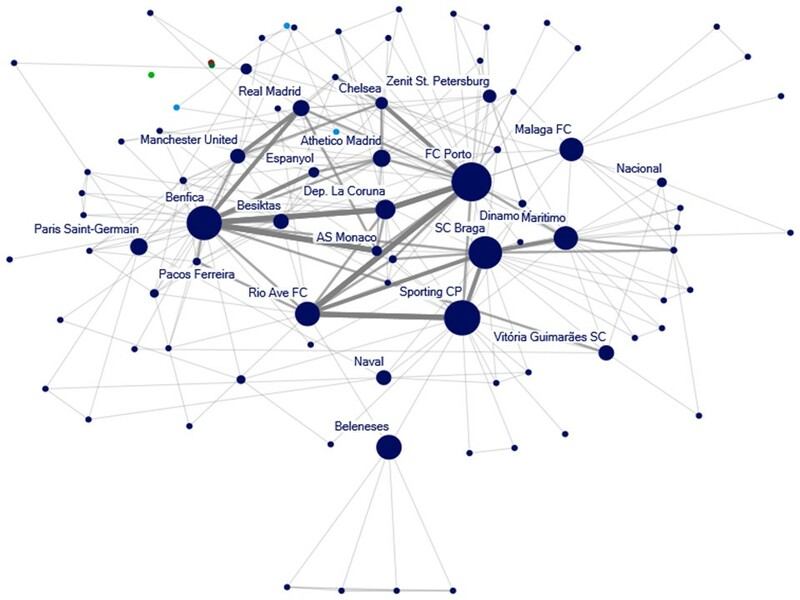 To put this graph (network map) into context, the circles (nodes) represent football clubs and the line linking the two (an edge) represents a transfer between clubs (the players that Mendes represents). The circle size is weighted on a measure of how often a circle falls along the shortest path connecting two other circle (football clubs), such that they might ‘broker’ between these parties (i.e., betweeness centrality). The lines (or transfers) are sized by number (or sum) of transactions between two clubs/circles. That means, the more transfers between the same clubs the greater the size of line. This is a basic sociogram and helps to understand the complex network structure that exists. The network of Mendes is complex. However, we identify six points to consider in this brief insight into this ego-trade network of a super-agent (up until June 2016). This is a truly global network covering approximately 88 football clubs across 15 countries, involved in 500+ transfers. Portugal still remains the heartbeat of the organisation, but Spain is becoming important in this network. Examination of the graph metrics show that there are relatively short lines linking a few football clubs. This perhaps makes trading patterns more predictable. The three giants of Portugese football, FC Porto, Benfica, and Sporting Lisbon are the most central in the network and the powerbase of the organisation. Interestingly, there is relatively very little trade directly between these three, indirectly this is different. That is, players don’t move from FC Porto to Benfica to Sporting Lisbon, and so forth. Smaller provincial football clubs play key brokering roles in this network. For example smaller clubs in Portugal, for example Maritimo and Rio Ave FC. It appears they almost serve to be used as a trading hub, whether older players getting one last transfer, or a test bed for two years of a young star before being traded off in the football circus. This will be possibly at odds with the traditions and beliefs of the supporters. This clearly demonstrates the network nature of this industry and gives initial insight into how these agents have become all-powerful. Finally, whilst it is interesting to see the football clubs that are part of the Jorge Mendes network it is also interesting to note those that are not. Leading us to raise further questions. What impact does this have on them when they are trading? Is the market restricted for these organisations? What about the economics of rational choice? Perhaps a better way to understand this market is transactionally or relationally – through the lens of relational sociology. From his deep knowledge of the industry, and understanding of the conventions and trading conditions of the market, Tony Asghar has somewhat of an alternative understanding of the network. “Jorge Mendes has created a network of players, clubs and managers with whom he has gained trust and respect as to being the man who can produce the best players for their clubs. Mendes is a corporate head-hunter or talent finder who is no different to a Head-hunter is Silicon Valley or Hollywood as the “go to guy” to get the deals done. “The issue of owning third party rights of players also comes into the world of the so-called super-agent, and although this is prohibited in the UK, FIFA and UEFA have still not regulated this type of transfer and Mendes and others have offered the service by purchasing a percentage of the player to allow the buying club to invest a more reasonable sum. Like the banks and financial institutions used to provide loans for these fees, the super-agents are able to assist because they have the funds and more importantly have the experience and know the market and can make a calculated risk on their investment when moving a player say from South America to Europe and knowing he may accumulate club and international appearances and then be ripe for selling on to EPL or other top league for profit. Therefore the commodities that players are becoming in the eyes of clubs and club owners are major financial investments and yes for every Pogba deal there will be a Falcao, some will work some will not. The super-agent is becoming powerful but they are also becoming a necessity to the oligarch owners to make financial investment decisions on players, however managers will always have the say on players in order to create a winning team, and rightly so and in my experience most top level managers will not be swayed or overruled by a super-agent (if the player is not right for him), that will never happen. Clearly the network here only relates to Jorge Mendes and the players he represents. Therefore, this is not a clear portrayal of how the market is structured. Yet this does offer an insight into the networked characteristics of trading between clubs that warrants further investigation and critical thought. This throws open questions of rational choice and utility models. In that clubs in the network, might be restricted by who they can trade with and for whom, whilst those clubs outside the network have barriers to entry into the market, given that this is an example of one of many super-agents in the market place. What does this mean for smaller clubs? Are they destined to become small brokers or feeder clubs to the game’s elite? Will their players trading at the behest of external powers, or super-agents? It appears that power is ultimately being taken away from them as a single entity. They are at the behest of neoliberal forces that have significant access to resources and therefore power. In a further development straight out of a text book example of Michael Porters five forces, the Fosun group who have a minority stake in GetisFute and heavily connected to Jorge Mendes have entered into a new market and purchased a Football Club, it will be fascinating to view events unfolding at Wolverhampton Wanders founded in 1877. Indeed, it will be fascinating to see how Mendes and the Fosun group use Wolves for their commercial gain. At present elite level professional football continues to develop and extend its commercial power, whether in the English Premier League or in emerging football markets within the Global South. As such, we should expect the role of the super-agent to become more prominent as they grow their network and most certainly in their power to influence player transfers in football. “The market is such that to have your club bring the biggest and best players, they need to call on the most expensive people and experts to provide the service. The culmination of transfer fees this window has exceeded 1bn and is excessive, however the market is dictating this and I don’t see it slowing down in the near future. A slow for deals at the top end or a slow for discretionary support at the bottom end”. Previous Preliminary Programme for Future Football: a design for life. “You’ve got that issue at Blackburn of an agent involved and deciding the future of the club, Jerome Anderson [of the SEM Group]… It’s baffling and it’s a serious threat to how clubs get run” (The Telegraph, 18 Dec 2010). As with most neoliberal ‘games’, when you are at the bottom of the pile no-one will care or hear you scream.